If you are alive and live in our modern world its safe to assume that you wear clothes. Perhaps, if you live in Florida, you probably wear fewer clothes than if you happen to live in Sweden like me. But since one can’t go around naked you will be wearing clothes of one sort or another. And if you wear clothes there is a really good chance that the clothes you wear will eventually get dirty. And unless you are someone who is a bit strange, you will also eventually want to wash your clothes. That’s what I was doing today. I washed a whole week’s worth of dirty clothes for 3 people. Many years ago, when I first came to Sweden, I got invited to a dinner party. One of the guests there was a man who had spent some time living in the US. For some reason that I no longer remember, the conversation turned to American washing machines versus Swedish machines. This guy said that he felt that American machines didn’t do a good job washing clothes. After all, they only take 20 or 25 minutes for a complete wash cycle and they don’t have very high water temperatures. I couldn’t take this lying down. I asked him how dirty did he feel that his clothes actually got in this day and age. I said that 150 years ago, when most people worked in the fields, took a bath maybe once a month, and washed their few items of clothing when weather permitted, then, yes, clothes got really dirty and probably were very hard to clean. But today, we sit in offices, rarely working up a sweat, we generally shower every day and we own a lot of clothes, changing them often and washing them frequently. How dirty can they possibly get? Now an average Swedish washing machine takes about an hour (sometimes more for the higher temperatures) to run through a complete cycle. It uses very little water and can wash at temperatures as high as 90 degrees centigrade (194°f). The wash tumbles around and around banging against the bottom of the drum as it falls down. I likened it to a mechanized version of when women (it was always the women) went down to the riverside to wash clothes by banging them against the rocks near the water. I guess this guy felt that high temperatures, a long wash cycle and hard treatment was what was needed to wash clothes. I think of that discussion each time I turn on a washing machine here. In my apartment I have one of those washer/dryer towers in the guest bathroom. Not all apartments have them. If you don’t have one then you have to go down to the laundry rooms on the first floor to wash your clothes. In one room there are 3 washing machines in varying sizes and a large tumble dryer. The washing machines are not like the large American top-loaders. They are front loaders and once you close the door and start the machine, if you forgot to put something in, a sock let’s say; well, that’s too bad for the dirty sock – it has to wait for another machine load in order to be washed. In addition to the washing room, there is another room that has a big heat fan blowing into it and plastic-covered cables strung up above my head that you can hang clothes on so they can dry in the heated room. I usually let stuff dry for a bit in the tumble dryer, to get most of the wrinkles out and then hang them up to finish drying in the drying room. My building has a system whereby you book a day and time that you will be doing laundry by locking your laundry room “key” into the appropriate slot. There are 5 available times each day, seven days a week to pick from. It’s not permitted to do laundry after 11pm or before 7am. You might not always get to choose exactly the time that you want to do laundry because someone else’s key might be in the slot you wanted to take. But I guess that’s what you have to put up with if you live in an apartment building. It’s sort of like having to accept living next door to a noisy neighbor. I started the previous paragraph by saying that I had my own washer/dryer in my apartment. So, if you were paying attention, you probably are wondering why I do laundry down in the laundry room. It’s because I like doing laundry down in the laundry room – or, at least as much as anyone can like doing laundry. Each week, I do anywhere from between 3 loads to as many as 6 loads of laundry. I will have the entire drying room filled with hanging pieces of clothing. I’m very organized about the way I hang stuff up. Things like my underwear that dry easily can be hung up in corners which don’t get a lot of heat. Things like jeans and heavy shirts get hung up right in front of the fan. And I’m very careful how I hang each piece up – I don’t just throw it over the cable. I carefully stretch it out over the cable so it hangs as straight as possible. I have a very strict no-iron policy in my home. If a few minutes in the tumble dryer isn’t enough to get rid of the wrinkles then it doesn’t get bought. If something actually manages to get past the no-iron radar then it rarely gets worn or it gets worn wrinkled. After a couple of hours hanging in the drying room everything is dry and ready to pluck. Or at least, that is what I imagine I’m doing as I go through the room taking down the dry clothing. I imagine myself walking through an orchard picking apples. I then take the newly washed and plucked clothing to the mangle room. I forgot to mention there is a third room – the room with the mangle in it. 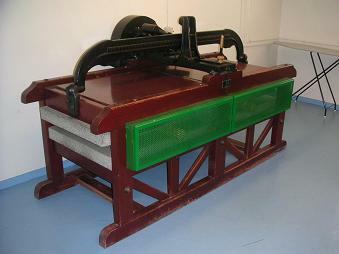 A mangle here in Sweden is a machine that is used to press flat bed sheets, pillowcases, curtains, and tablecloths. The one in my mangel room dates back to the 40s when my building was first built. It’s now out of order and I have never used it. But the room has a long table that is perfect for folding clothes on. After folding all the clothes in neat piles I carry everything back to my apartment and I don’t have to think about doing laundry again till next week. Now if you are still paying attention you will realize that I never said why I don’t use the washing machine in my own apartment. When we renovated our apartment 12 years ago I thought it would be great to have my own washer/dryer. Then I could do laundry when ever I wanted or decided to. And of course I did. I would be doing laundry 2, 3 or even 4 times a week. There was always some form of laundry in process. There might be wet stuff in the washer, drying stuff in the dryer, half dry stuff hanging on the rack, (even up in my apartment I didn’t dry clothes completely in the dryer because they either shrunk or got very wrinkled and I already told you how I felt about ironing), or piles of folded stuff waiting to be put away. I was doing laundry all the time! I was thinking about it all the time. I was at the mercy of dirty clothes! I had lost control of my life. I started to hate the sight of my laundry hampers! Five minutes after one hamper was empty it started to fill up again. I started to feel like the Greek king Sisyphus, doomed to push a huge rock up a mountain only to have it roll down to the bottom so that he would have to do it all over again, day after day. That was when I decided to go back to the peace of the laundry room. I might not always get the exact time I want but its close enough. While it does take me 5 or 6 hours from start to finish, its over in a day and I don’t have to think about laundry for a whole week. With my memory I usually am able to completely forget about dirty laundry until the overflowing hampers remind me that its time again. And if there is some sort of laundry emergency I still have the machines in my bathroom that I can fill up whenever I want to. Once again, I’m in control and for a recovering control freak like me, that’s a good feeling.